We seek to provide an exceptional service experience for clients seeking a comprehensive approach to managing, creating, and transferring their wealth while protecting their assets. We are proud to add that we can measure our success in terms of client satisfaction. We listen in a way that facilitates simplicity and allows our clients to make informed decisions about their financial future. MSA Financial specializes in retirement planning, business and estate planning, and asset protection. This site is for our clients and visitors, and we hope you find it valuable and informative. Please take advantage of its many features. From here you can take a sneak peak of how our business works, understand the services we provide, and gather current quotes and news on individual stocks and funds. Clients can use our Client Center for Account Access to view their portfolio and access documents. You can also send us any questions you might have directly through the site. 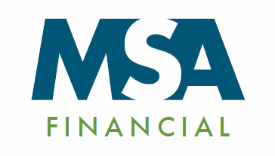 MSA Financial is an independent financial service organization. We provide asset management and investment planning services for individuals, families and small business owners. Whatever your goals may be - helping your children afford college; paying for a wedding, a family trip, or a vacation house; early retirement; or being able to leave a legacy to your heirs or a favorite charity - we can help you establish an effective strategy.